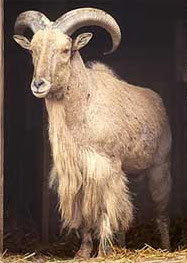 A relatively large sheep with horns curving outward, backward, and then inward and marked with strong transverse wrinkles; horns of females similar but somewhat smaller; tail relatively long, reaching nearly to hocks and with long hairs on terminal half; a conspicuous growth of long hair on throat, chest, and upperparts of front legs; no beard as is found in goats; upperparts and outer surface of legs uniform rufous or grayish brown; blackish mid-dorsal line from head to middle of back; flanks, inner surface of legs and belly whitish, but the chest colored like the sides; horns yellowish brown, darkening with age, set close together (nearly touching at the bases), and attaining a length of 50-80 cm. External measurements of a moderately large adult male: total length, 1,650 mm; tail, 141 mm; hind foot (tip of hoof to hock), 363 mm; ear, 116 mm; height at shoulder, 950 mm. Weight of males up to 145 kg; females to 65 kg. Dental formula: I 0/3, C 0/0, Pm 3/3, M 3/3 X 2 = 30. Native to the dry mountainous areas of northern Africa; introduced into the Palo Duro Canyon area of Texas in 1957-58, where it has become firmly established. Also present in the Edwards Plateau, Trans-Pecos, South Texas, Rolling Plains, and Post Oak Savannah regions as a result of private introductions. 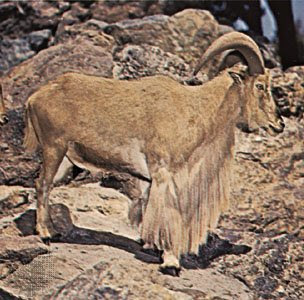 This sheep, also called the aoudad, is adapted to a dry, rough, barren, and waterless habitat — much as is the native bighorn sheep of our southwestern deserts. Consequently, it is quite likely that these two could not survive together in the same area because of competition between them. 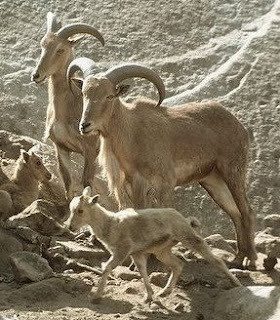 These sheep live in small groups comprised of old and young animals of both sexes. They are expert climbers and can ascend and descend slopes so precipitous that man can negotiate them only with great difficulty. 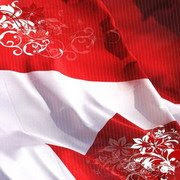 Consequently, they are difficult to hunt. 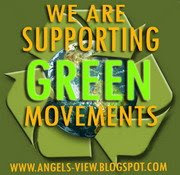 Their food consists of a wide variety of vegetation including grasses, forbs, and shrubs. Apparently, they are capable of producing metabolic water and can survive for long periods without access to fresh water. However, when water is available they utilize it for both drinking and bathing. In studies conducted in New Mexico, Herman Ogren found that 79 species of plants were included in the diet of these sheep; of these, 13 were grasses, 20 were shrubs and the remainder forbs. Mountain mahogany (Cercocarpus breviflorus) was the most sought-for single plant. On a yearlong basis this species comprised nearly 22% of the items found in rumens of the sheep. Ogren found some seasonal variation in the diet. In winter, grasses comprised 86% of the rumen contents; browse, 11%; forbs, 3%. In spring, summer, and fall the browse species, mainly oaks and mountain mahogany, comprised about 60% of the diet; grasses, about 26%; and forbs (various species of "weeds") made up the balance. On a yearlong basis, browse species comprised 49% of the diet; grasses, 42%; forbs, 9%. The breeding season appears to be rather extended, but most of the breeding is concentrated in the 2 months from mid-September to mid-November. The gestation period is about 160 days. Consequently, most of the lambs are born between late February and late April, but some lambs are born as late as November. According to Ogren, females may become sexually mature at the age of 8 months, but normally they are older. All females 19 months of age or older that were collected in the fall and winter season were gravid, lactating, or ovulating. 3 weeks Deciduous dentition complete and consists of four pairs of deciduous incisiform teeth and three pairs of deciduous premolars. 8 months First permanent molar erupted or erupting. 17 months Second permanent molar erupting. 18 months First (inner) permanent incisor erupts. 21 months Third permanent molar erupting; deciduous premolars being replaced. 23 months Second deciduous incisor shed. 27 months Permanent dentition except for outer two pairs of incisiform teeth; last molar not fully exposed. 36 months Third pair of permanent incisiform teeth present; last molar fully exposed but unworn. 48 months Fourth (outer) pair of deciduous incisiform teeth (the canines) being replaced. 60 months Full set of permanent teeth. These sheep were first brought to the United States in about 1900 and have been reared in zoos and on private preserves for a number of years. They were first released in the wild in New Mexico in 1950 and in Texas in 1957, when 31 were released southwest of Claude in Armstrong County. Thirteen more were released near Quitaque. These introductions were highly successful in the Palo Duro Canyon area. By May of 1966 the population had increased to an estimated 400-500 sheep. By 1963, the population had increased to such a level that a controlled hunt was deemed advisable. 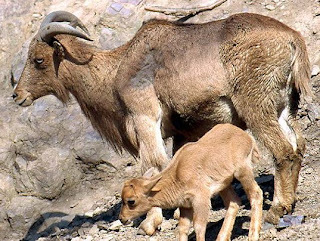 Forty-two permits were issued; six rams and three ewes were harvested. In 1964, 50 permits were issued; eight rams and seven ewes were harvested. In 1965, 70 permits resulted in a harvest of eight rams and eight ewes. Statewide, the population in 1989 was estimated at over 20,000. Whether this animal will eventually become a pest, as have most of the "successful" introduced animals, remains to be seen. There is some evidence that they compete directly with mule deer for food. They also have been observed feeding on winter wheat crops growing adjacent to Palo Duro Canyon. 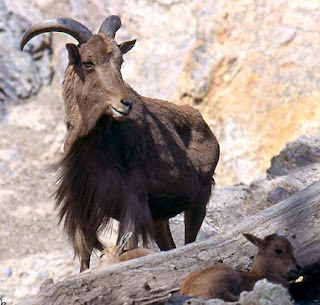 In the Trans-Pecos, Barbary sheep may have a deleterious impact on bighorn sheep reintroduction efforts.